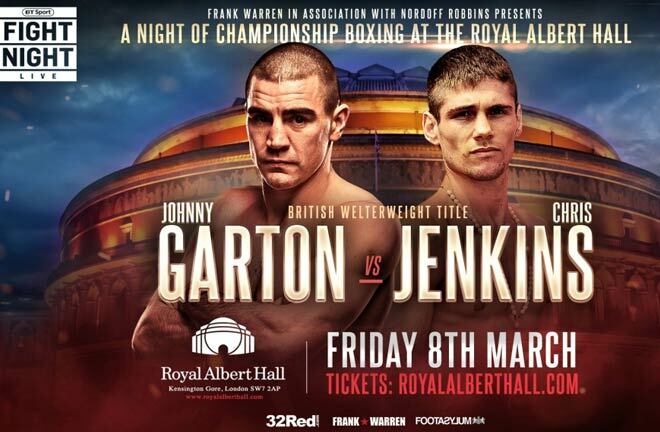 Johnny Garton will make a first defence of his British welterweight title against Chris Jenkins at the Royal Albert Hall. The Pexican collected the treasured Lonsdale belt following a thrilling encounter with Gary Corcoran in October – stopping the Wembley man in the 11th round – and he now faces the tough Welshman on March 8 when boxing makes its return to the historic South Kensington venue. Jenkins, 30, has twice before challenged for the British title at super lightweight. As a then unbeaten fighter in July 2015, he took on Tyrone Nurse for the vacant title and an exciting fight was declared a majority draw by the judges. The pair rematched four months later and Nurse prevailed in another closely contested bout. The 20-3-2 Jenkins has subsequently added a further four wins to his record, but has also suffered the misfortune of severe cuts curtailing two of his fights against Akeem Ennis-Brown and Darragh Foley. “There were rumours that I would be fighting Chris and now it is confirmed,”reacted the champion to news of his defence being booked in. “I think it is a good tough fight and I am looking forward to it. “Chris is a very tough man and he has been down here at our gym sparring before when Liam Williams also came down. It was a very good spar between us, very hard, and I expect the same on the night. “He is very energetic and a bit of a crazy fella – it is going to be good,” added the Alan Smith-trained Garton, who claims he will employ some technical boxing to add to his typical marauding style. Elsewhere on the show at the Royal Albert Hall, Nicola Adams OBE will look to make history and be the first female crowned World champion at the venue as she challenges for the WBO World flyweight title against Arely Mucino on International Women’s Day. Daniel Dubois follows in the footsteps of British heavyweight greats to fight at the Hall and takes on Razvan Cojanu in his tenth fight. Liam Williams puts his newly won British middleweight title on the line against Brentwood bruiser Joe Mullender. Lucien Reid will fight Indi Sangha in what will be his toughest test to date, while GB flyweight Harvey Horn and cruiserweight talent James Branch feature.